Polmadie (/ˌpɒlməˈdiː/; Scottish Gaelic: Poll Mac Dè, lit. 'Son of God pool' is a primarily industrial area of Glasgow, the most populous city in Scotland. 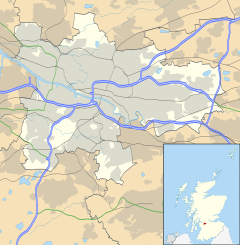 Situated south of the River Clyde, Polmadie is close to residential neighbourhoods including Govanhill (to the west) and Toryglen (south-east), with Oatlands and another large industrial zone at Shawfield to the north on the opposite side of major railway lines and the M74 motorway, Junction 1A of which serves the area since 2011. For over 50 years, the most prominent landmarks within Polmadie were the 66 metres (217 ft)-high twin chimneys of a now disused waste incinerator plant operated by Glasgow City Council. This was replaced by a 'Recycling and Renewable Energy Centre' on the same site operated by Viridor with a less conspicuous stack of70 metres (230 ft). Also located in the area is Alstom's Polmadie Depot, a large railway maintenance facility for Virgin Trains which is the most northerly train stabling and maintenance area on the West Coast Main Line (WCML), since the line runs through Polmadie on its final approach into Glasgow Central station. The area was also home to BOC's industrial gases filling plant and main Scottish base, until this moved to a more modern facility in early 2007 to Cambuslang just outside Glasgow in anticipation of the completion of the M74 Southern link and associated redevelopment of the surrounding area. Polmadie is derived from the Scottish Gaelic Poll Mac Dè. The bulk of the place-names of the neighbourhoods of Glasgow were either coined by Gaelic-speakers or adapted to Gaelic from Cumbric. Polmadie is an early Gaelic name, containing the Gaelic "poll" (pool), but which usually means burn or stream in areas where Gaelic replaced Cumbric. From a late 12th century form, Polmacde, it is clear that the middle element is Gaelic mac (of (the) sons). The third element could be either the personal name Daigh, or the Gaelic Dè (of God), referring to an early religious establishment beside the burn. A remarkable feature of this place-name is how the original stress-pattern has survived, even centuries after its meaning ceased to be understood by those using it locally. It is still pronounced "pawmaDEE" (with a half stress on "paw" and full stress on "dee"), exactly as it would have been stressed in Gaelic. The location of the Alley & McLellan construction yard in Polmadie might appear perverse, as the yard had been built a considerable distance to the south of the river, with the expansive final approach into Glasgow Central Station imposing just one of many unbreachable barriers between it and the Clyde. However, the company specialised in supporting the far reaches of the British Empire[page needed] by constructing vessels that were dismantled into kit form once they had been completed. The resulting set of parts was frequently enormous and a logistical nightmare to transport; re-assembly also depended heavily upon the availability of skilled hands at the customer’s premises. However, as in the case of the SS Chauncy Maples, this was frequently the only viable option when the ultimate destination was very far inland, away from any semblance of modern communications. New Statistical Account of Scotland. "List of Charters referring to Polmadie Hospital". ^ Vivienne Nicoll (28 November 2013). "Work under way on £154m Glasgow recycling centre". Evening Times. Retrieved 25 January 2019. ^ Paul Williams (25 July 2016). "Glasgow network visits Viridor GRREC Polmadie ECS". Eco Congregation Scotland. Retrieved 25 January 2019. ^ Alan Ferguson (12 June 2018). "£150m rubbish centre to be running to full capacity this year". Evening Times. Retrieved 25 January 2019. Wikimedia Commons has media related to Polmadie.